Front I/O: 2 USB 2.0, headphone and microphone. 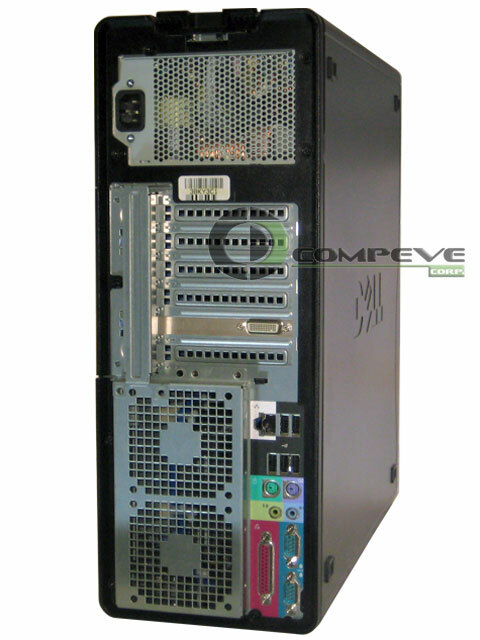 The Dell Precision 490 is a fully-featured high-performance workstation with a compact, flexible chassis design. With excellent scalability for its size, the 490 offers up to two Dual-Core Intel® Xeon® 64-bit processors, up to 32GB of memory in four fully-buffered DIMM channels and a wide range of high-performance OpenGL graphics cards. 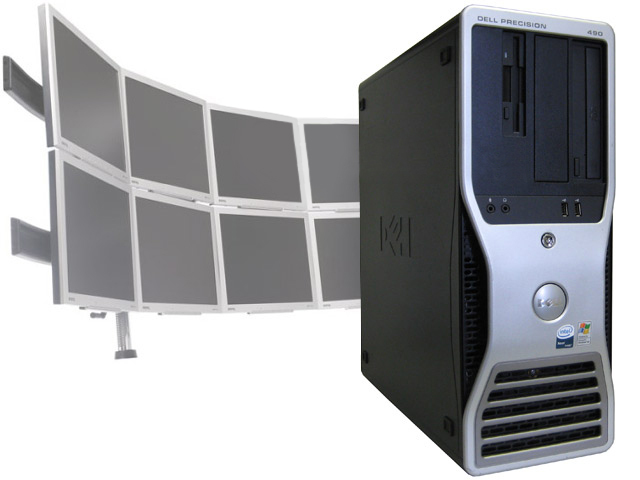 This all means that the Dell Precision 490 is an excellent choice for critical, compute-intensive workstation environments where space is a concern. The Dell Precision 490 is equipped with up to two Dual or Quad-Core Intel Xeon 5100 and 5300 series 64-bit processors for a total of up to eight execution cores in two sockets. Dual-Core Intel Xeon processors can deliver a substantial performance increase over Intel single-core processors for multi-threaded applications, multi-tasking environments or very demanding single-threaded applications. The new Intel Xeon 5100 and 5300 series features a new architecture - Intel® Core™ micro-architecture - with a shorter pipeline, lower clock speeds and higher front side bus speeds designed to deliver higher performance levels than previous generation Intel Xeon processors. Multi-core processors allow your system to split tasks between separate processor cores so that they can share the load and get more done in less time. The cores can do more work per second, allowing you to run multiple or multi-threaded applications (DCC rendering and Analysis applications) with noticeably quicker results. 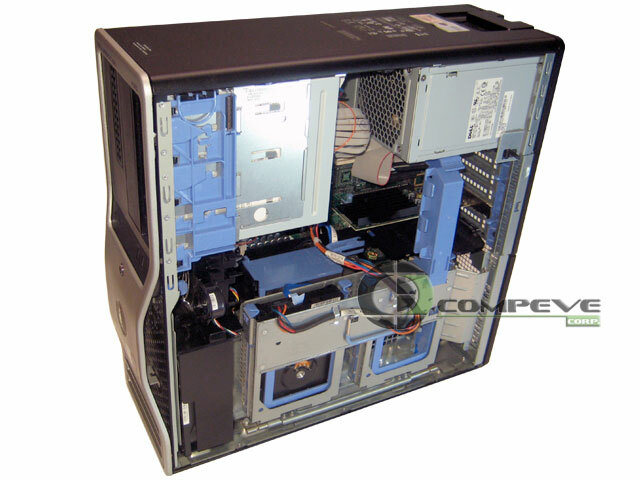 In addition to being easily convertible from a mini-tower to a desktop orientation, the Dell Precision 490 gives you maximum performance in an optimized, compact and rack-ready chassis. That makes it perfect for financial trading floors, high-density design studios, or anywhere else that space is at a premium. Without sacrificing scalability or performance, the 490 will stay out of the way so you can work unimpeded. Dell has delivered a totally new customer-driven chassis design with the Dell Precision 490, designed to deliver flexibility, reliability, and ease of access in a compact, rack-ready form-factor. It features rotating optical bays, one-hand internal access, front-panel diagnostic and network LEDs and a new front bezel design for better ventilation. Dell is committed to operating in a responsible and sustainable manner around the globe. Environmental responsibility is one of the key areas of focus for Dell. Examples of Dell's activities in this area include product recovery and recycling and forest stewardship. Dell has reached another key milestone by offering RoHS-compliant Lead-Free configurations on the Dell Precision 490. The Dell Precision 490 offers a wide range of high-performance graphics cards for many of the most demanding visual applications like CAD, GIS, and digital content creation. These graphics options are designed to handle the demands of 2D and 3D applications for all types of engineering, architecture and design. All the 490's graphic options also support a dual-monitor configuration. "OpenGL graphics for the most demanding visual applications."